U.S. Senator Joni Ernst (R-IA) and a bipartisan group of lawmakers introduced legislation to reform the process for an administration to issue tariffs on the basis of national security threats to better align with the original intent of the law and to increase congressional oversight of the process. “When bad actors abuse and take advantage of our trade policies in a way that threatens our national security, the president needs to have tools available—such as tariffs under Section 232—to hold them accountable. However, the Department of Defense, not the Department of Commerce, should evaluate and verify the national security basis for these tariffs. 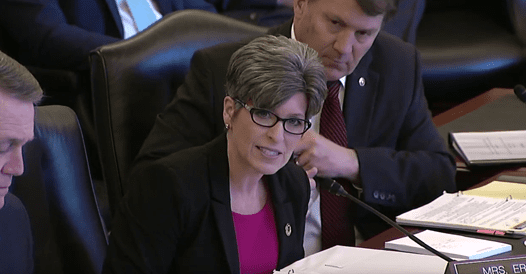 Increasing congressional oversight will help the president make decisions that support American jobs while protecting our national security,” said Senator Joni Ernst. The Trade Security Act would require the Department of Defense, rather than the Department of Commerce, to justify the national security basis for new tariffs under Section 232 of the Trade Expansion Act of 1962. A bipartisan group of senators, including Senators Rob Portman (R-OH), Doug Jones (D-AL), Lamar Alexander (R-TN), Dianne Feinstein (D-CA), Deb Fischer (R-NE), Kyrsten Sinema (D-AZ) and Todd Young (R-IN), introduced the bill. Representatives Ron Kind (D-WI), Jackie Walorski (R-IN), Terri Sewell (D-AL) and Darrin LaHood (R-IL) introduced a companion version in the U.S. House of Representatives. “This bipartisan bill will help prevent unnecessary trade wars that hurt Arizona’s economy,” said Senator Sinema. “Indiana is the most manufacturing intensive state in the country, and Hoosiers continually express their desire for Congress to exert its Constitutional role in the 232 process, which has the ability to detrimentally impact Hoosier farmers and manufacturers if wrongly utilized. I’ll continue working with Senator Portman and the Finance Committee to ensure Hoosiers have a seat at the table for future trade discussions,” said Senator Young. Bifurcate the existing Section 232 process into an investigation phase, led by the Department of Defense, and a remedy phase, led by the Department of Commerce. Splitting these responsibilities, while guaranteeing consultation between the two departments at all stages of the process, plays to each department’s strengths to ensure that the statute is used for genuine national security purposes. Require the Department of Defense – instead of the Department of Commerce – to justify the national security basis for new tariffs under Section 232 and make the determination about the national security threat posed by imports of certain products. If a threat is found, the Department of Defense would send its report to the president. In the event that the president desires to take action based on the finding of a national security threat, the president would then direct the Secretary of Commerce, in consultation with the Secretary of Defense and the U.S. Trade Representative, to develop recommendations for how to respond to the threat. After receiving the recommendations of the Secretary of Commerce, the president would decide whether to take action. Increase the role of Congress in the Section 232 process by expanding the process whereby Congress can disapprove of a Section 232 action by passing a joint resolution of disapproval. Currently, Section 232 contains a disapproval resolution process limited only to the disapproval of actions on oil imports, which was inserted into Section 232 in 1980 by Congress in response to concerns about the misuse of the statute. This bill would expand the use of that disapproval resolution process to all types of products. The reformed disapproval process will only apply to future Section 232 actions. Require consultation with Congress throughout the Section 232 process.